Emilie Elias received her bachelor’s degree from the University of California at Berkeley. She then attended the University of Southern California, School of Law, where she was a member of the Law Review. Upon her admission to the California Bar, she began a private practice in the South Bay Area of Los Angeles County. After a number of years of practice, she applied to be a Commissioner for the Los Angeles Superior Court. She was selected as a commissioner and served in that capacity until her appointment from the Governor as a Judge of the Los Angeles Superior Court. At the time of her retirement she was the Supervising Judge of the Complex Civil Department of the Los Angeles Court. 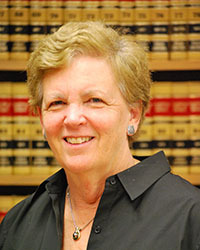 She has served on the Judicial Council, State of California. She has also served on the Boards of legal organizations and has received awards from several Bar Associations. Judge, Superior Court of California, County of Los Angeles, 2000-2016. Direct Calendar Civil ("Fast Track") Department, 1993-2005. Assistant Supervising Judge for Civil, Complex Department, 2011-2016. Judicial Council Coordination Motion Judge for Asbestos Litigation, 2011-2016. Founding Member of JES- Los Angeles Superior Court Education Programs, 2010-2016. Commissioner, Superior Court of California, County of Los Angeles, 1989-2000.